Let Your Baby Sleep in Peace with Comfortable Nightwear! All parents wish to make their baby’s night time as comfy as possible. The sleep time is the most important part of a baby’s daily routine because he performs fine only when he sleeps fine. 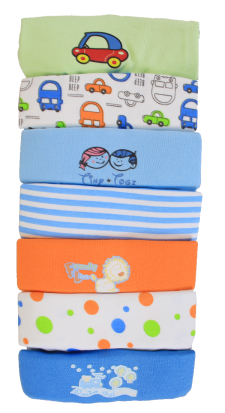 Unlike adults, babies need more sleep so they need more coziness, and for that, you need to buy them easy night wears. Visit Affordable.pk to avail the best online boy’s night suits shopping at the most reasonable prices. Apart from taking care of your shopping needs, the team takes care of your baby’s, too, so this is the place you should be visiting. The boy’s night suits in Pakistan aren’t much preferable, to be honest. Parents, especially mothers, make their babies wear homemade clothes at nights that aren’t easy enough. It’s a traditional practice, but it should be avoided and replaced with night-exclusive clothes. The uneasiness at the night time and lack of sleep are the common complaints of babies under 12. The reason behind this is they do not wear clothes that are comfortable enough. In order to avoid this, buy night suits for babies available at Affordable.pk and give them the comfort they deserve at their age. It’s a common mistake of putting all the attention to your formal and daily clothing and ignoring the night time. Your baby should be at ease when he sleeps and spends time at home because that’s the time when he is all to himself. If you want them to be their best versions, make their nights as easy as possible and night wears play an important role for that. The boy’s night suits prices available at Affordable.pk are the most reasonable. The lowered prices are the exclusive feature of the online marketplace that isn’t found elsewhere. The high level of comfort at such amazing prices makes the shopping experience better than ever. What is more, the night suits are available in packages that save you a great amount. Some packages have three nightsuits and some have five, and the prices of all are amazingly lowered. Furthermore, the suits include homely pajamas and t-shirts that don’t only provide your babies with ease, but also make them look adorable. Keeping the importance of sleep time in mind, visit Affordable.pk and buy a nightsuit of your baby’s size. The team takes only four to five working days in delivering your desired product to your doorsteps.